If the rest of the world follows the example of the Swedish city of Gothenburg, the long commute and work weeks that many face may become a thing of the past. The year-long study will have one group of city employees working for 6.5 hours, while another works for the traditional eight hours a day. A car factory in Gothenburg has already experimented with this model with great results. I’m not saying that everyone has to offer a 6.5 hour workday for their agents to be happy. I do feel, however, that executives in North America could learn a lot from Gothenburg’s proactive approach to experiment with a solution outside of the standard "nine-to-five" model. Unfortunately, most of the world’s workforce isn’t lucky enough to live in Gothenburg, and with the ever growing number of commuters in the Greater Toronto Area (GTA) where 3C is located, the typical commuter can face a staggering 80-minute commute to and from work every day—one of the longest commutes in North America! And even in other cities in North America, commute times can range from 20 to 45 minutes. Stack that onto an 8-10 hour workday, and you have one frustrated employee. Spending that much time sitting in grid-lock can take its toll on your tank – and your wallet, since the price of gas is soon expected be twice what it is today. With more and more employees spending their limited budget on gas to commute to and from work, this will doubtlessly lead to less time with their family, which amounts to less sleep, throwing their balance of life into chaos. The job market isn’t like it was 30 or 40 years ago, where if you lost your job on Monday, you’d have a new within walking distance from your home by Friday. More and more job seekers are being forced to take jobs farther away from home, potentially for smaller wages. Many households report that they spend much of their budget on fuel and car insurance, with less money for food, clothing and activities for their children. Here are a few questions to ask yourself: Do they have a job that allows for a flexible start/end time? Do you have a technology solution that can allow them to work from the cloud, reducing their time in the office to 1-2 days per week? If a full time solution is out of the question, can a part-time solution be established (1-2 days per week)? We have worked a “reduced hour incentive package” into a few employee plans within 3C, and preliminary results have already shown an increase in efficiency and productivity, as well as a reduction in sick days. The year-long experiment involving city employees in Gothenburg only started in April 2014, so it will remain to be seen how it pans out for them. I encourage you to take a page out of the Gothenburg play book and be proactive with establishing a plan that takes ‘balance of life’ into consideration, while you still can. via Why Commuters Will Soon Become Extinct… | LinkedIn. A new report has established that cities now contribute to 37-49% of global greenhouse gas emissions. The report also reveals that urban infrastructure accounts for over 70% of global energy consumption. 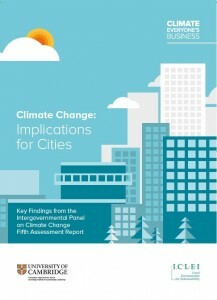 • Many emerging climate change risks are concentrated in urban areas. • Climate change impacts on cities are increasing. • The world’s urban population is forecast to almost double by 2050, increasing the number of people and assets exposed to climate change risks. According to ICLEI President David Cadman, “This Cities Summary succinctly summarises the key implications for urban areas. It is a must read for all local decision-makers”. The report was published jointly by The University of Cambridge’s Institute for Sustainability Leadership and Judge Business School and ICLEI with the support of the European Climate Foundation. The European Commission has long recognised the important role that local authorities play in improving the environment, and the significance of their high level of commitment to genuine progress. The European Green Capital Award has been conceived as an initiative to promote and reward these efforts.Bristol, European Green Capital 2015 has demonstrated a long term commitment to improving its urban environment. The city has been working since 2000 to reduce its contribution to climate change by developing and delivering a series of strategies and action plans, such as the Bristol Climate Protection and Sustainable Energy Strategy and the Local Transport Plan to 2026.